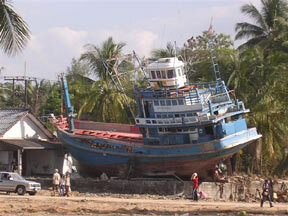 This is an example of some of the damage that occurred in Thailand, one of the countries affected by the tsunami. This photo was sent to us by Blair graduate, Dr Usa Bunnag who went to help the victims in Thailand. On December 26th, 2004, early in the morning around 9:00 a.m. an earthquake occurred in the Indian Ocean and spread shockwaves out dramatically in every direction for almost 1000 miles and destroyed the coastal areas of many countries. Some of the major countries which have heavily destroyed areas are India, Sri Lanka, Indonesia, Thailand, Somalia. The death tolls in all of these countries are in thousands which combined together makes more than 157,000 dead. It was 26th evening when we were having a family get together at my sisters house. After a long period of time another sister came home with the news of the disaster that took place in south Asia. We were all shocked and completely out of the party mood. Everyone there started asking all kinds of questions. “How many people are dead? Where did it all happen?” And there were many other questions. We were learning more and more about the affected areas. Then my sister said the name of Tamil Nadu in south India. After hearing the name of Tamil Nadu everyone’s mind was thinking the same thing. That is where my uncle lives! With no delay we started trying to call him in Tamil Nadu. We called for quite a long time but we always got a busy tone. The next day my brother-in-law put on the TV to know more about the disaster. As we were going through the news we got to know the real atmosphere over there in south Asia. We found out that there was almost no living condition there. Wherever we looked, we could only see the dead bodies floating around and all the destroyed houses. All the electrical and phone lines were down. We tried very hard to contact my uncle but we were unsuccessful. Everyone at home was very nervous and sad. But after a week passed by, we got a long distance call at our house. My brother picked up our phone and to his surprise there was my uncle on the phone. The government had come to him with a special telephone truck to allow the people who survived to call their relatives. My brother excitedly shouted for everyone in the house saying that our uncle was on the phone. My mom was the first one to talk and so on everyone talked in the house. But when I got the phone to talk I really couldn’t talk much with him except some encouraging words which I thought could make him feel better. After I talked with him I was feeling real sorry for him, and everyone in the family had tears rolling down there cheeks. This made me cry too. My uncle told us that he lost everything that he had, every belonging and all of his property. But the only thing he had left was his family and his life. Even though he lost so much, I am really thankful to God for his mercies upon him. I just want to tell you that the sea is made up of drops of water. So even a penny, if that’s all you have, can join other pennies and help rebuild those disaster areas. 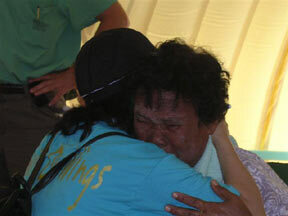 Dr.Bunnag consoles a woman who told of her loss because of the tsunami.